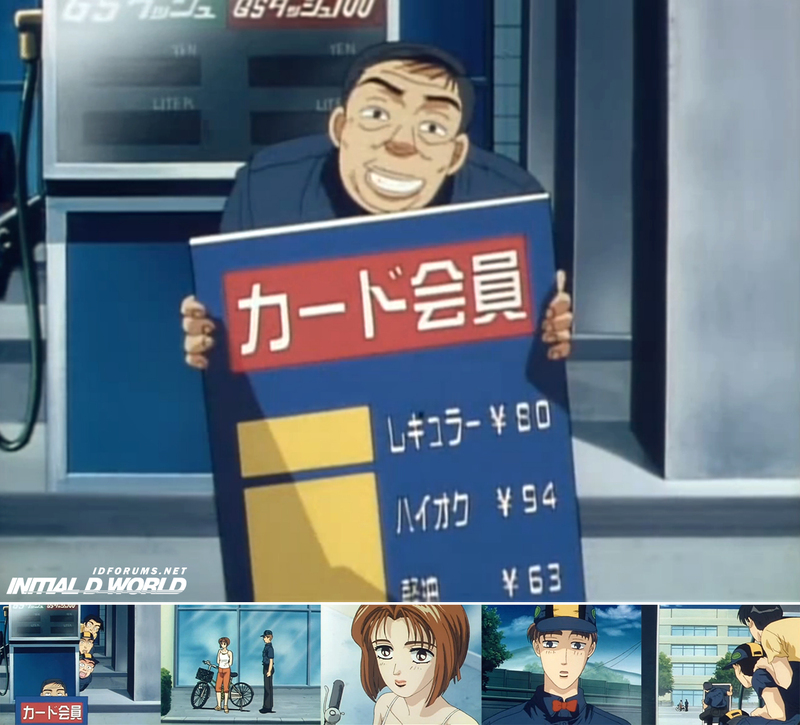 Initial D World - Discussion Board / Forums -> Cheap Initial D Gasoline? Do you remember this scene from Initial D First Stage? It's right after the S14 downhill rain battle. Natsuki went to see Takumi at his work. Like the good friends they are, the gas station gang had to take a peep at Takumi's girlfriend. But of course, they weren't being discreetly enough. Did you notice the price on that sign the manager is holding? Yes, those price were indeed actual price at that time in Japan. Don't believe me? Check this out. The second item from the top is ハイオク (High-Octane gasoline) for 94 yen per liter. The third item from the top is 軽油 (Diesel) for 63 yen per liter. Cross reference this to the historical pump price for gasoline here: http://goo.gl/w7Tp5o You'll notice the average gasoline price was around $1.02 to $1.25 per liter in Japan from the year 1995 to 1998. Then you have to take the exchange rate into consideration. US dollars to Japanese Yen was exchanging at 1 to 105 around 1995. So 94 yen was actually slightly cheaper than the average at that time in Japan. Considering they are in the Gunma Prefecture, it makes sense because gasoline price is generally more expensive in the big cities. Add on the fact that those prices were for カード会員 "Cardmember", it makes sense to be slightly cheaper than average. » Screenshots from Initial D First Stage ACT.23「雨のダウンヒルバトル!」"The Rainy Downhill"
Image size reduced, original size: 1270 x 1151. Click here to view the image in its original dimension.